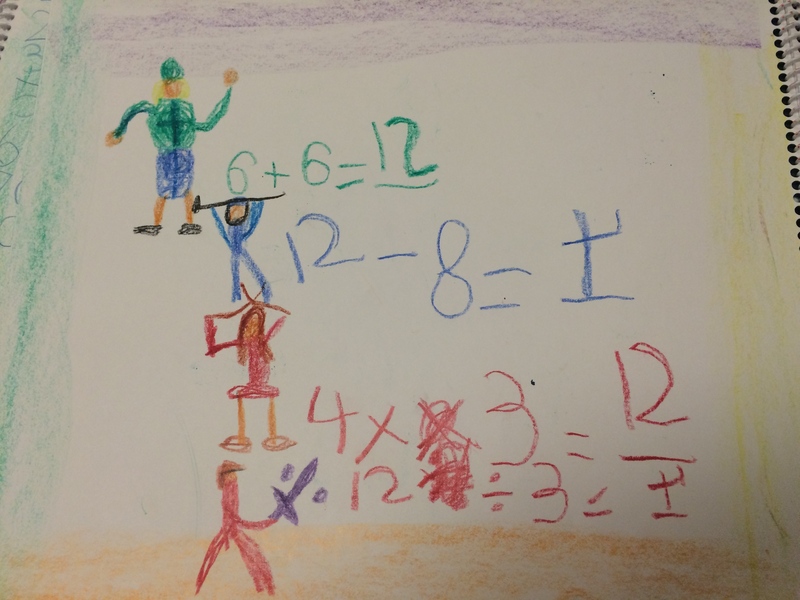 First graders reviewed Mul de Plier – our multiplication character – and we moved a step further in our understanding. In the fall, we kept our multiplying simple, in the 2’s. This week, we began to see that Mul de Plier can cross her sticks many times – 3 times, 4 times, 5 times and more! The children quickly made this connection and understood what to do with their manipulatives. We will continue to practice this. Next we reviewed our counting gnomes who mine beautiful jewels and took this a step further. The gnomes fill their bags with 10 gems and we all filled small bags with our gems in the classroom, but then we added these bags together and counted by 10’s. We also learned how the gnomes wrote these numbers. Two bags = 20. Three bags = 30 and so on. 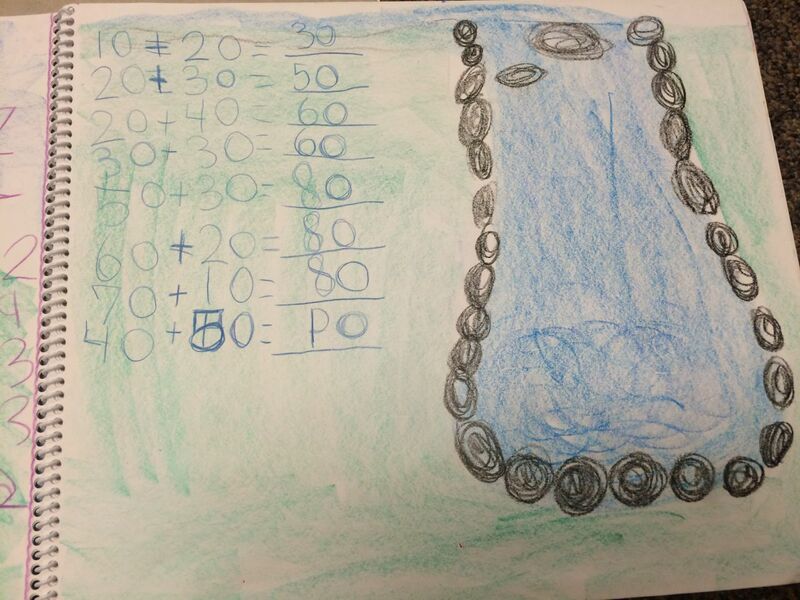 They loved learning to write numbers this way and understood quickly. We also talked about “extra gems.” Sometimes they may find 2 bags full and 3 extra, so we write that number as 23. Second graders jumped right into their times tables. We introduced the 4’s, 9’s, and 6’s last week. All of these were introduced on a circle numbered 0 to 9. We did this on the floor (first graders helped) with yarn. We threw the ball of yarn to the 4, 8, 12, 16 etc – and found that the shape created was a beautiful 5 pointed star or pentagram. 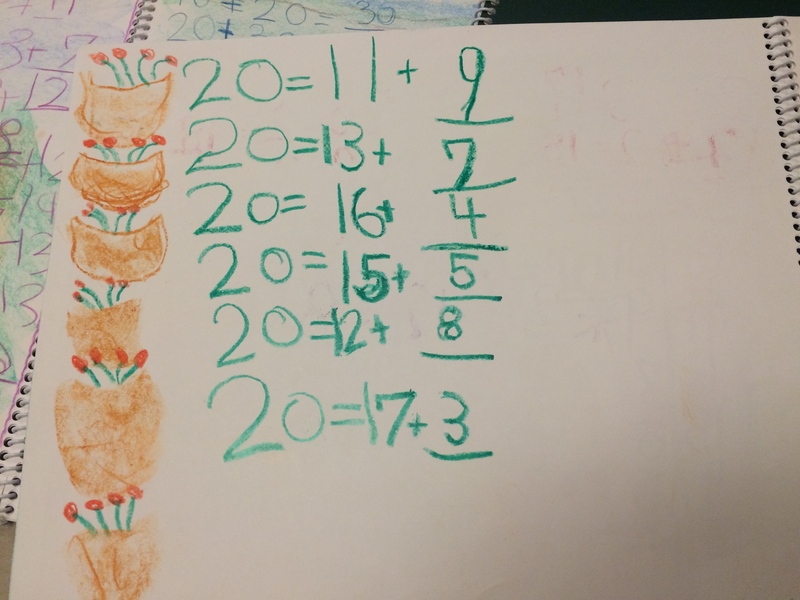 Then we transferred this image to the chalkboard in beautiful colors and the second graders drew it in their main lesson books accompanied by the times table and division table. 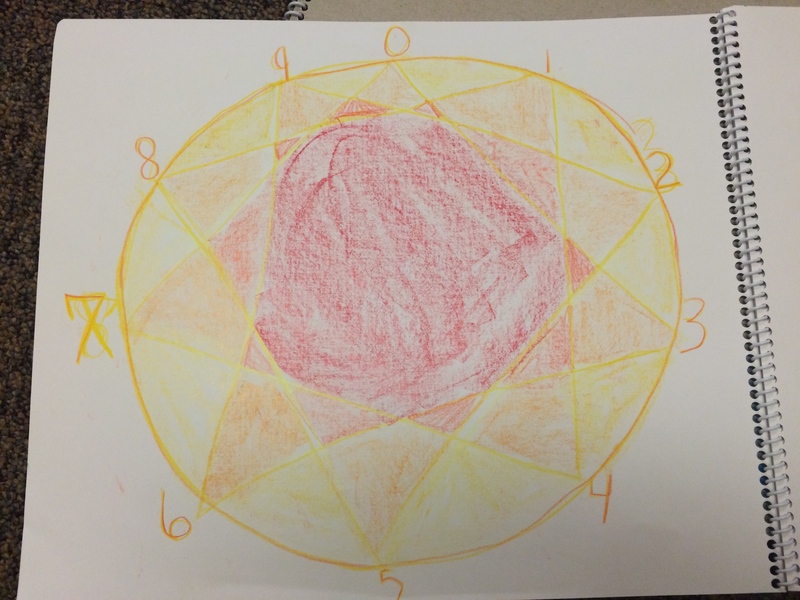 The 9’s formed a decagon and the 6’s formed a pentagram again. Throughout all of this work I am highlighting number patterns, trying to find little tricks that help us remember how to count by 4’s, 6’s, and 9’s. We are also solidifying our understanding of the division tables, which are really just our times tables switched around. Each day we review what we did the previous day so we are keeping everything fresh and alive. We did lots of math practice this week – counting by 2’s, 3’s, 4’s, 5’s, 6’s, 9’s, 10’s, and 11’s with bean bags, jumping rope, and clapping. We worked on dictations and math problems from the board for second graders that they copy and solve in their main lesson books. The story we began in this block is the book, The King of Ireland’s Son, by Padraic Column. It is a wonderfully long and complicated fairy tale that we will read for the next 8 weeks. It will be the basis for our next language arts block. The children are raptured with the imagery, the names, the storyline. It’s a great way to end our math work each day. The children love this poem and have little sly smiles on their faces when they recite it. Were imprisoned, oh what could they do? First graders were introduced to Prince Divide. We heard a long story of his struggle to remove a star rock from the narrow passageway that led out of his city. Eventually he split the rock in two with a sword forged in the depths of the earth by gnomes – made of star iron. His sword in the middle of the two halves of the rock form the divide sign. After hearing this story, we practiced dividing with our gems (manipulatives). Prince Divide’s sword also has the power to divide items equally whenever he taps the sword on the ground, so he settles many disputes between families and village members. If 4 people bring him 12 baskets of apples and ask for his help, he taps his sword on the ground 4 times and the baskets magically divide into 4 equal groups of 3. We then learned how to write division sentences that showed the work we were doing with our gems. This still needs practice – as I was expecting. Multiplication and division are meant to be fully understood in 2nd grade, so I’m working on laying the foundation right now. Next the children heard a story of how Prince Divide met Mul de Plier and they realized how well they could work together. Mul can multiply items for the villagers and Prince Divide can split them up equally! We looked at how multiplication is opposite of division and so the math sentences involve all the same numbers but in different order. This is still a bit foggy for the first graders, but the concept will be solidified next year. Second graders were introduced to all of the remaining times tables this past week – including today. We did the 6’s and 9’s, 10’s and 11’s, 7’s, and then today the 8’s and 12’s. All of these were completed with geometric drawings, done on the floor with string and then put into their books beautifully. This was a large task for the 2nd graders, but they completed their work. There was certainly a capacity built for writing – they had so much writing to complete. I was proud of them all for sticking with it. On Friday we had a great time having Circle together – 1st to 4th grade. We sang Yankee Doodle Dandee and pairs of children lifted up a third child and twirled them around. It was so much fun! Fairy house building was a smashing success – many thanks for bringing all of the supplies. And then after a very long recess Maeve’s class and Luna paired up with students from 1st and 2nd grade to read a book to them. All of the older students were delighted to do this – it was lovely to see. We had some time to free draw and then ended with lunch time – a great ending to the week. At the beginning of the week, 2nd graders finished up and then reviewed all of their multiplication tables. They put a beautiful and helpful chart into their main lesson books to help them with these times tables. First grade reviewed all four operations and practiced them with gems and in writing. We did this through story – all four of our characters worked together to distribute Happy Addy’s cookies throughout the village. 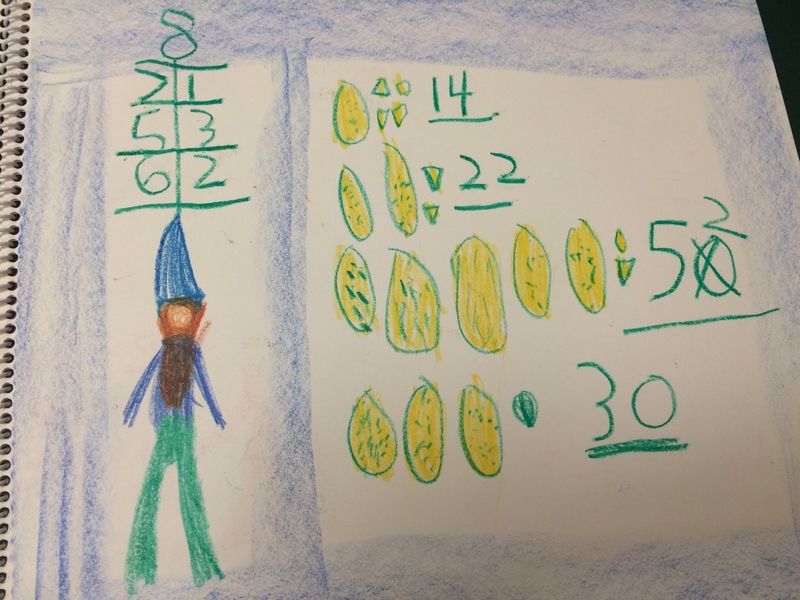 Then we reviewed how we learned to write numbers above 10, talking about our mining gnomes again. On Wednesday, I introduced a new story to both 1st and 2nd graders. This story will take us through the rest of our math block this week. 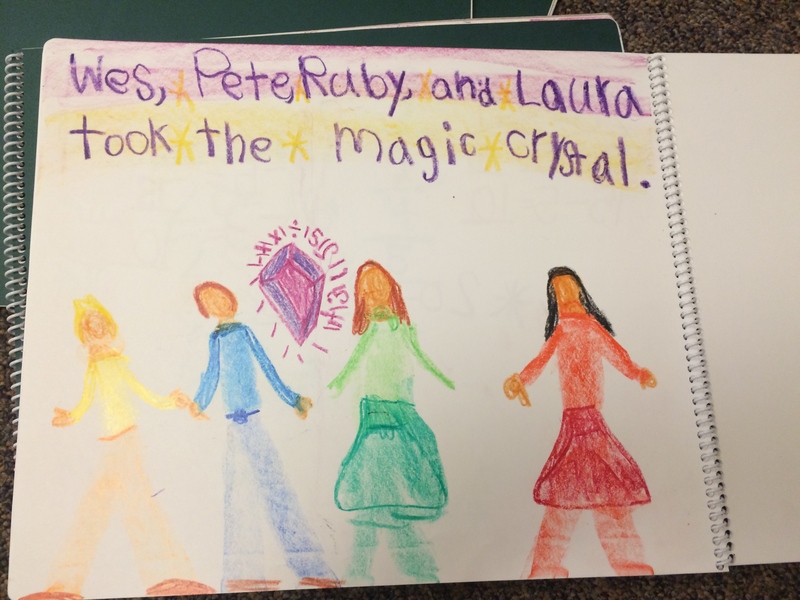 I drew a big picture of a pathway that traverses two mountains on an extra chalkboard and introduced four children – Wes, Pete, Ruby, and Laura. These four children were chosen by the king to retrieve his magic crystal from the dragon. The crystal has magical math powers and the dragon has left math puzzles all along the path to his castle that the children must solve. Our class is helping the children solve these puzzles. Each day the dragon leaves us a message in his wooden box (a poetic message!) and then our task is set before us. I’m using this story to teach addition and subtraction strategies to both first and second graders. We are working together as one group, doing simple and then more complex problems. I’m also using the story as a pedagogical one – for the 4 children have characteristics of everyone in our classroom and they will learn some lessons themselves. Then the dragon had us regroup the number 20 (first grade task) and add multiples of 10 such as 10+10, 20+10, 20+30, 30+50, etc. The children are very engaged in the story and we are working on the math. It is very difficult for some of them and easy for others. I’m trying to get the hang of our rhythm and ease up on my expectations for the second graders. Because they only came 3 days a week last year, we are a bit behind in our goals for 2nd grade math. It cannot be rushed, so there may be elements we don’t get to this year. This week in our math story the four children succeeded in getting the math crystal from the dragon after accomplishing some mighty tasks. They had to shorten big piles of stones in order to walk across them, fill baskets with wildflowers, and throw huge piles of sticks onto a fire in order to progress on their journey. Each day we tackled addition or subtraction problems – first working a task in addition and the next day working a similar task in subtraction. I’m trying to get the children fluent and at ease with numbers 1 to 20 and then use that ease with higher numbers. 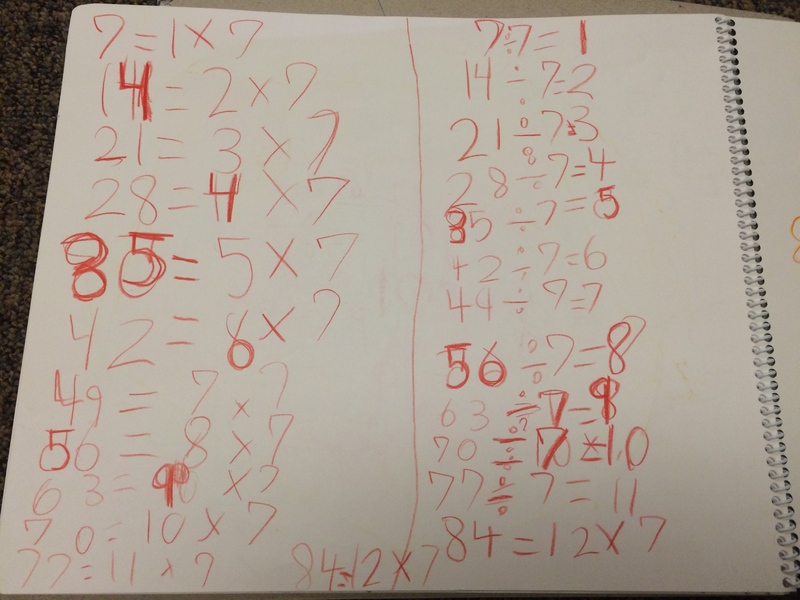 Then we did this in subtraction – always trying to go from whole to parts. 70 – 30 = ____. Then they added examples such as 25 + 3 or 36 + 2 and 25 + 10 or 36 + 10. And then did the opposite 25 – 3 or 36 – 2 and 25 – 10 or 48 – 10. To keep it a challenge for students who can do this easily, I always threw in something more difficult in the story. For example – the characters in our story had to throw sticks in a fire and they were taking sticks out of big piles. We were subtracting here. We started with 77 sticks and threw in 6. Well then we had 71 and threw in 2. This involves carrying and not all of them could do this in their heads or count backwards to solve the answer. The next challenge problem was 64 – 7 – a bit more difficult. For students who needed extra help, we used gems. Large gems were multiples of 10 and small gems were ones. So for the number 23 we had two big gems and three small ones. This helped with the addition and subtraction. We did movement this week and lots of counting. I recognized that all of us need practice counting between 20 and 100 forwards and especially backwards. The transition numbers are more difficult. 29 to 30, 39 to 40, 49 to 50 and 50 to 49, 40 to 39, 30 to 29. One of our movement activities helps to teach students to add or subtract problems such as 12 + 6 or 18 – 11. 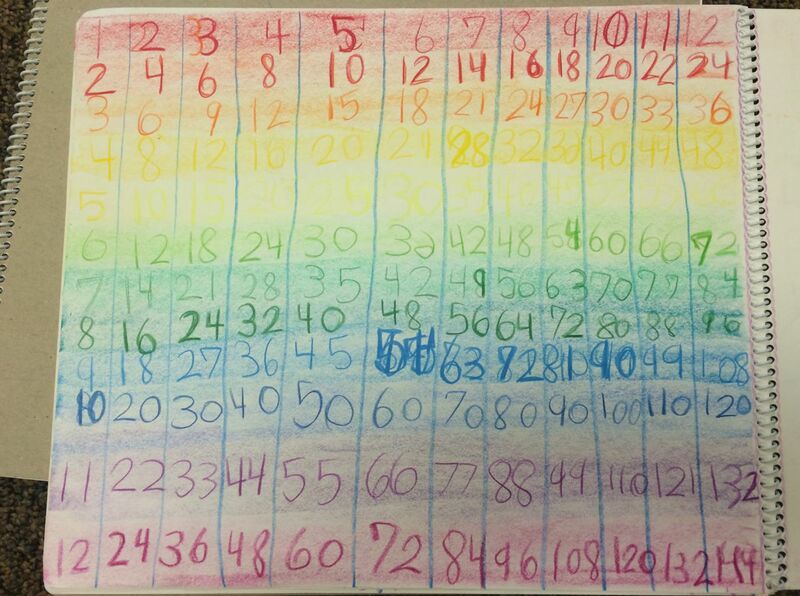 I placed numbers 11 through 20 on the ground and asked questions such as, “What is the difference between 19 and 12?” or “What is 12 plus 7?” or “What is 18 minus 4?” The students had to walk the numbers while counting them – so 12 plus 7 – stand on the 12 and count 13, 14, 15, 16, 17, 18, 19 aloud while walking these numbers and counting the steps on your fingers. We finished up with a day of review – noticing how much work we did in this 4 week block. We drew a cover page into our main lesson books and then brought our completed math book home.